These are going to be short and sweet from now on if they weren’t already. 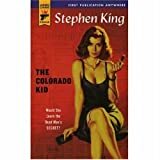 The Colorado Kid by Stephen King. I only read this book because the new Syfy series Haven is based on it. From the Haven previews, I think it’s only going to be loosely based on the book. Almost the entire book consists of these two old journalists telling their intern a story about an unsolved mystery that happened years earlier. Reading it made me remember why I don’t read Stephen King anymore. Something about his writing style gets on my nerves. I advise passing on this one and just watching the TV show. I read this book using the Kindle apps on my iPhone and my work PC. It’s the first time I’ve read a book that way. Bitter Seeds by Ian Tregillis. This was another Sword and Laser pick. It was interesting. Think alternate history WWII with super-powered people that use batteries to power their abilities. I love alt history and I love superpowers and they go pretty well together in this book. I wasn’t really into the beginning and the end, but I really enjoyed the middle. When I started getting close to the end I could tell that this was the first in a series. I later found out that it is the first in a trilogy. If I had known that before I started, I may have waited to read it. At this point, I’m not sure if I’m going to finish the trilogy. Maybe if I had the other two to read right away I would’ve been more likely to continue.